I’m teaching at a writer’s conference this week, so instead of one of my in-depth posts, I thought I’d create a quick checklist for you. 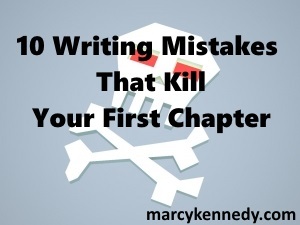 Here are 10 writing mistakes that kill your first chapter (in no particular order). Get them before they get you! Your first line needs to raise questions in the reader’s mind and make them curious or hint at trouble/conflict. Preferably both. Head-hopping is always a problem, regardless of where it crops up in your manuscript, but that’s not what I’m talking about here. I mean a point-of-view shift carried out with a proper transition. Confused? In your first chapter, one of the things you need to do is convince the reader to invest in your main character. They need to spend time with them to do that, and if you switch POV characters within the first chapter, the reader doesn’t have enough time to make that connection. This point is the doppelganger of (2). It’s extremely difficult to be interested in a story when you don’t know who matters, what they care about, and why they’re doing what they’re doing. Connect the reader to a character immediately and allow the reader to experience the story through that person. How am I supposed to remember all these people, especially if they’re introduced without much to set them apart? Drip feed your characters, and make each important character memorable in some way. This could be internal dialogue that fills the page with so many italics that my eyes start to bleed, dialogue where I’m not sure who’s speaking, or any number of other distracting, confusing formatting glitches. These pull the reader right out of the story and shift their focus onto something they shouldn’t even notice. I could actually expand this to say “allowing your character to do anything uninterrupted for too long,” but giving a speech or musing to themselves are particularly problematic. Since this is a short list, I’ll give you just three reasons why this is an issue. The first is that the reader usually ends up feeling preached to. The second is that you lose all sense of setting. The third is that it stops the action dead. Backstory can be hinted at, but it’s normally something you should withhold until later when the reader really wants to know it and it’s pertinent to what’s happening in the present. Why? Backstory, by definition, is over. The reader wants to see your character getting themselves into trouble in the present. A calm, happy opening isn’t the way to establish your character’s normal world or make the reader like your character. Show them trying to solve a problem in their normal world. It’s active, it creates reader sympathy, and it shows the normal world. If you’ve read my book Showing and Telling in Fiction, then you know I’m an advocate for telling having a good and useful place in fiction. Your first chapter usually isn’t that place. Showing is more entertaining and more interactive, and engages reader emotions—all good things if you want to hook a reader and keep them turning those pages. Dialogue doesn’t automatically make your book feel active. Good dialogue does. Do you have any other common first chapter problems you’d like to add to the list? Which of these causes you the most headaches in your own writing? Interested in more ways to improve your writing? Deep Point of View is now available in print and ebook forms. Except for #1, these are generic. Moreover, if I were to prioritize, I’d work from the tail end of the list forward and for the entire novel, except for that proverbial “hook” in #1, which certainly can be more than one line! BTW, what writers see as a good hook is often different than what readers see. I had one author critique one of my books, saying something like, “Ho hum, another murder in a public place–what do I care?” More than a few readers said something like this: “OMG, I immediately know why this happened!” Fortunately readers rule, not writers. Some of these flaws can be minimized by using shorter chapters. Modern genre fiction tends to be more minimalist anyway. Those long chapters might have been appropriate for Les Miz, or for what some call “literary fiction” (is genre fiction not literature? ), but yesterday’s chapter sections are often today’s chapters, for these reasons and others. Sorry. I should have written “I immediately want to know….” Even though I’m a speed reader and touch typist, my mind still works faster than my eyes and hands. LOL. That said, the biggest one I tend to see in writing groups is a first chapter that doesn’t need to be there at all. Writers lay out character and world information easily gleaned from the text in future chapters, without any need for hand-holding. That’s so true. Character and world building can even be done in dialog in later chapters. Some narrative might be required, but you don’t want it smothering everything else in the hook. I think even a James Bond-like and nearly separate story involving the protagonist can be a good hook (that first section in the movies) if done well. I use one in Aristocrats and Assassins to show why Castilblanco “needs” that European vacation, for example. This is definitely not one line, but readers seem to like it. The bottom line: the writer must grab the reader’s attention from the start, or it’ll be rough going. Cliches are always problematic in fiction, but they’re especially damaging in our first chapter. Good point! Yes when I see, “Rookie cop so-and-so….began his shift that night…” I close the book and move on! Thank you, this is a very helpful list. I think I’ve been guilty of each of these at least once. I think this post is very helpful. I like how it details, in short, how to do some things right and how doing it wrong can hurt your first chapter, unlike the last thing I read on the subject which basically took away all possible beginnings. Doing the latter makes it very hard to jump in head first to writing, especially for those out there just beginning their creative journey. I have always had an issue with dialogue, but I’ve tried to get better by giving characters different dialects and tones etc. I think it helps to have a character that maybe slurs, and maybe another that always sounds sarcastic. Little things like that help a lot. Ok, what about….gulp….having a different POV in the prologue and first chapter, but still diving deep into the main character in chapter one? I switch back and forth throughout my story. I’ve heard this is a no-no but I like it and think it works. Should I scrap the prologue and just dive into chapter one? Without seeing the prologue, it’s hard for me to say. What I’ve found with most prologues, though, is that we writers tend to use them to stick in backstory that the reader really doesn’t need to know at the beginning. We want the reader to know about it because we love it, but we’d usually be better diving right into chapter one and dealing out the truly important bits of backstory later. How do you know if you’ve introduced too many characters too soon? There’s no hard number, but if you’re introducing more than three in the first chapter, you’re getting into potential trouble territory. When you have critique partners or beta readers look at your first chapter, make sure to ask them if they could easily keep all the characters straight. I disagree with your backstory theory. In some novels it is a necessary asset. It can make the reader want to read more. James Rollins novels are a good example. I don’t know how to thank you, but, thanks! This is such a great help. I am totally with you in tip number 8! I’ve read lots and lots of books making that same mistake. And gosh, I’m so glad that at least I know someone now who had pointed that out. I do have a question, however, concerning this first chapter tips we’re babbling about. Do you have any idea how to write the first sentence of your story? What kind should this be? In your opinion, what’s the best way to do? Onomatopoeia? Thanks for the great question Robin! Instead of answering this in a comment, which wouldn’t provide nearly enough space, I’m going to use it as the topic for another post. If you have a website, I’d be happy to link back to it and give you credit for the question when I answer it. One of my pet peeves is a protagonist who is too perfect. She or he is good at everything, attractive, kind to animals, moderate in habits and all around admirable. These too-perfect characters often possess a modern and enlightened point of view that seems out of keeping with their surroundings or era. Too perfect equals too dull. Wonderful list. I have done some of these things, but I think it really depends on the context and plot of the story, what you need the reader to understand, and what you want them to see. Definitely stay away from these things as much as possible. But sometimes it is alright to break these rules. For instance, I have a story that follows multiple characters (different chapters, and only until they meet, a bit later in the novel). The chapter where you meet my “real” main character, it opens with him writing. He is a very philosophical thinker and he is very opinionated. But he is in no position to freely speak his mind. So he is constantly writing his thoughts down, in hopes that he might one day use them to change the world. He does this all the time. The reader is given an insight into his normal world through this, and they also get a touch of the past, mixed up with a fair dose of the world’s current situation. My dear friend, who is reading my novel has told me that this chapter is the best so far. There are times when these things are not black and white. I wrote this as a path to my worldbuilding, to show how one of the Gods influenced this realm. I expound on the realms creation, and introduce my (pro/an)-tagonists in my next chapter. Not sure if your points address that. Would be interested in opinions/observations. This is my first visit to your blog and your 10 writing mistakes has cleared up a problem I have been having with my first mystery series. I started the story about 12 years ago and began work on it again in 2014 and felt guilty for not finishing it but I had so many other ideas and they were overlapping each other and I have gone entirely into too much detail about my main character’s past. Thanks for sharing your 10 writing mistakes. I don’t write a lot of fiction, but I do read a lot of it, and I would tag onto the point about not introducing too many characters: also make sure that the characters you *do* introduce have distinctive names. never give two characters names that start with the same letter, unless they are the Bobbsey Twins. there are whole groups of names that are essentially the same to me: Bob, Bill, Bert–they’re all just old guys. Emma, Eva, and Ava–nope, I have no idea which one is which. Jaden, Aiden, Leiden, and Caden? I don’t care if one is female and the others are male, to me they’re the same person, and I’ll be making notes on my bookmark to try to keep them straight. Which I hate! If Olivia is trying to escape from Fred to tryst with Dominic, I’m with you! The man looked up at her, like she was a madman. I’m sure she was. Her stormy eyes and bitter personality beheld insanity. Madness. He didn’t move, or even dared take a breath. He could pass for dead. “Are you hesitant, lieutenant?” She asked, widening her eyes and raising the question that scared him. He looked to his side where he caught a glance of a broken picture frame of two teenage girls and his wife. He sighed, and looked back up at the woman. “No.” He said, exhaling. His eyes jotted to the floor. His heart beat faster and faster by the second. At any given moment, she could signal a guard to take him away, and that would be the last time. There was no doubt she could. He’d seen it before. “Good.” She said with a twisted grin. “I knew you were a good one.” She glanced over at the picture he had looked at a second ago. She walked closer to pick it up, and examine it closer. “That’s your wife?” He nodded. Hoping she wouldn’t do something he’d regret. “Lovely.” She said, a bit bitter. She tossed the frame on the desk, without giving another thought. The frame’s glass cracked even more. “Please, I’d prefer you to keep clutter off your workspace.” She raised an eyebrow, grinned, and walked away. He knew she was referring to the picture. He slipped the picture out of the broken frame, and tucked it away in his bag. He tossed the frame into a trash can. The glass made a loud crash when it hit the bottom. As his heart-rate slowed, he swallowed nervously. He could hardly breath. Countless men or women were asked to come into the other room to speak with her for a moment. No one really knew what happened to them. All anyone knew was one thing; They never returned. Most could take a pretty good guess, though. It was a settle example and reminder to do your job, and never question it. After that, I switch to the MC’s sister, Lilly. it shows her waiting for her dad (the person in the first paragraph) by the window. It talks about how she gets worried if he doesn’t come home when he usually does, because he might have been Taken. Does that count as switching POVs? And will it damage the first chapter? I’m just trying to set questions in place for the reader. Questions that want to make the reader continue on to find out so and so. I’m reading and trying to figure out the troubles with my first chapter ^^ First thing my beta readers noticed is that it hasn’t a good beginning, so I changed the first paragraph to put my main character in the middle of an action, crawling away from the fire and checking her gun while watching the enemy (I decided the “normal world” would begin at chapter two, as I needed to show how my main characters met). One of the things I realized is that there were too many characters, and I cut a lot of them, but I still have five I found absolutely necessary; three of them will be dead by the beginning of chapter two (it’s a historical fiction, I need them explained), and the other two are my main characters. I broke all the rules when I started a book with the description of an idyllic natural scene of a forest at night. As part of the description, there is a small, furry creature (called a Moon Rat) navigating the dry leaves at the forest floor and a predatory bird sweeps down to catch it. At the last second, the critter jumps out of the way and into a dark cavity as the bird’s claws snap on dry leaves and twigs. This is when I introduce my main character and his lover, who have been laying together next to a nearby pond and the noise alerts them to the fact that it is now late and the guard would be doing their rounds (they are violating curfew). So, the couple gets dressed and the POV character is putting on his boot, the Moon Rat (the same one who avoided the bird earlier) is inside and it bites his foot. He throws his boot, which makes noise that alerts the guards and a story-beginning chase ensues. I violated the rules, but I find it hard to get rid of the descriptive beginning. My wife loves it, but she loves descriptions, so she may not be the best judge. The reason I don’t want to get rid of it is that the rat, a normally harmless creature who bites when cornered foreshadows my main character’s story arc. Because my beginning didn’t have a lot of action (the chapter actually does, but the first couple of paragraphs don’t) I wrote a more dramatic prologue that sets something up for later, but I know that some people skip prologues, so they may find themselves with a descriptive opening. I have to give it more thought, and if necessary, cut it (and a scene where the POV character gets some poultice for the now infected bite). I like your descriptive beginning. Please don’t change it much. Its not too long. Anyways.. rules are meant to be broken. There are exceptions to every rule. Just follow your gut and do whats best for YOUR story. Complete agree with you. I open a profile on wattpad, just to keep my name (who knows when I will need it), but being honest, this plataform is the worst place to find “good literature”. Once, I told the writer some mistakes she done on grammar or redaction. Her answer: keep away from my stories if you dont like it. English is not my native lenguage, but another, and I coloborate with another amateurs writers, and some turns into formal publishers. Its sad pretending be a writer, but dont wants leave your own mistakes out. I trully believe, any script can be better.